A few years ago, when the wife and I first started brewing our own coffee at home, we used to get it from Trader Joe’s. We’d get a couple of cans, open them at the store and grind the beans, and then over the course of the next 4-6 weeks proceed to finish both of them off. We’d brew the ground coffee and drink it in the morning. Nowadays, we buy the whole bean coffee in the store and grind the beans at home. Not only that, we grind them right before drinking them. What I do in the morning is come downstairs, feed the cat, and then grind the coffee beans. I put the ground coffee into the coffee maker and then head upstairs to shower. When I’m ready to come for breakfast, I head downstairs to a fresh pot of coffee. Mmm, that just can’t be beat. The best coffee we’ve found comes from Whole Foods, although it is also available in their own coffee houses, and that’s Café Ladro. Our coffee tastes vary but right now it’s our favorite. It costs around $12-$14 per bag, depending on where you get it. It’s a little less than a pound, so it’s more expensive than what we get at Trader Joe’s, and about double what we would get from a large chain in a big grocery store. Our favorite type of coffee from this brand is the Fremont coffee and the Queen Anne blend, both named after Seattle neighborhoods. There’s more blends than that but the two I mentioned are the best ones, I think (although to be fair, we’ve only tried one more). I do look forward to my cup of coffee every morning. Some people drink it in order to wake up, or to think better. I just like the taste. And to think, I never really started drinking coffee until I was 33. What was I thinking? This is a follow-on from my previous post on the book Sapiens. I’ve been thinking a lot after I read it about how humans have been conquered by religion, empire, and especially money. Our religion, that people have no trouble following, is Romantic Consumerism (the need to buy a lot of different things). Real religion requires frequent sermons and reminders to people to behave in a certain way; not so with Romantic Consumerism, we’re good at doing it all on our own. After reading the book, I came away somewhat depressed by the state of the human species and how I see so much of the downsides of humanity in myself. For example, I personally don’t care about almost anything that doesn’t affect me, at least when it comes to charitable causes. There are plenty of people starving all over the world, but I am an expert in dissociating myself from it and worrying about my first world problems. Yet capitalism seems to be the great hope of things. We often look back at history and think “Wow, people back in the day would champion science just to advance knowledge.” But it’s not true, even Charles Darwin hitched a ride on the boat to the Galapagos as part of a science+empire expedition. The king of England let him hitch a ride along and that’s where he developed the theory of evolution, but he didn’t get funding for himself. Instead, the English empire was busy building its empire. So really, capitalism+science work together. There is no free lunch. I recently read another book, The Rational Optimist, where the author says that trade + capitalism is the basis of nearly all human development. After reading it, I agree that he is right about a lot of things. In a capitalist society, we care about things if they give us value. I’ll buy your shoes with some money, and you take that money and buy some cabbage, and the shopkeeper takes that money and buys my coats that I weave. We don’t care about each other’s wellbeing, but we care that each other provides us something of value. I bring this up because I recently read a left-wing friend of mine post something on Facebook – “You are worth so much more than your productivity.” This is a rebuke of capitalist society that measures people by their output, whereas people instead should have intrinsic worth and not be taken advantage for that reason alone. I agree with the sentiment, but it’s not how humans work. The fact is that we don’t care about other people’s plights as much as our own absent of some underlying influence. For example, religion teaches us to care about others; secular humanism teaches us to value others. But those two philosophical systems must be continually nailed into us, day after day, and if they don’t we revert back to our norm of not caring. But if they sell me something, then suddenly I do care about strangers. That’s not the way it should be, but it is the way our species works. So when it comes to conservation projects, such as saving the African Okavango Delta, us westerners can complain that Africa should be preserving it and the animals within it for its own sake. That is crazy talk, it is more worthwhile for the locals to bulldoze whatever land they need so they can raise crops. Instead, only capitalism can help; if tourism vastly increases the amount of return on the Okavango Delta, then people will want to preserve it. And it’s the same everywhere else. Altruism says you should do good for good’s sake. Capitalism can actually make this a reality by providing a profit and doing good at the same time, such as eco-tourism, or employing poor people in the developing world, or micro-loans that return a profit. That may not be what altruists want to hear, but if given a choice between a capitalism/social good mixture that is sustainable, and pure altruism that is not (in the long term) then I have to pick the former. If I didn’t get a tax break for making charitable donations, would I do it? Probably not, unfortunately. But is it a good thing that I do it, even though I reap a benefit? Absolutely yes! So maybe the capitalists have it right after all. While I don’t agree that capitalism is in itself a moral good, I do think that a product or service that generates a sustained profit which also serves an underlying social good will work better in the long term (e.g., me buying dark chocolate that goes to protect endangered species). It’s entirely possible that I am tricking myself with regards to this, but I hope I am not. Am I allergic to citrus fruit? I think I’m allergic to foods with a lot of citric acid in them. 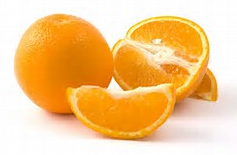 Or, two fruits in particular – oranges and persimmons. I like both of these fruits. 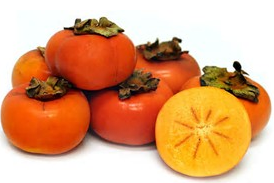 In fact, I wait each year for persimmons to come out so I can eat them. Yet in the past year or so, I have gotten canker sores in my mouth and the last thing I ate was either a persimmon or an orange. This has happened at least 3 times, maybe 4. I first came up with the theory last year when I got a canker sore in my mouth. I started doing research and I found that sometimes people in the middle class get them when they eat fruit that have a lot of citric acid. That’s when I first got the idea about this. I know it happened once, and it may even be twice because I wouldn’t normally bother with that research unless it happened two times in short succession. Then this year, I ate an orange in the evening and the next day I had a canker sore on the back of my throat that took almost a week to go away. A few weeks later I had a persimmon and the next day, once again, I had a canker sore near the same spot that took five days to get better. Now, I’m not saying that I definitely am allergic, but what I am saying is that this has happened three times and the recovery time from first appearance of canker sore to recovery is not worth the enjoyment of the fruit. I am tempted to try it one more time just to confirm, but if it is true I don’t want to have to wait 6 days later when I can swallow without pain. So I think I may be allergic but I am not 100% sure; but I always don’t want to test to confirm in case it is true. What a weird place to be. Two months ago, I bought a book called Sapiens: A Brief History of Humankind by Yuval Noah Harari. There are few books I can say this about but this one revolutionized my thinking. I give it 5-stars and it’s something I quote all the time; there are few books I can say that about (another being The Better Angels of Our Nature, by Steven Pinker). I think the book is incredible. What’s it about, you ask? Well, as you can guess from the title, it talks about the history of the human species. Ever since I started becoming interested in human anthropology a few years ago, I’ve gravitated towards these types of books. 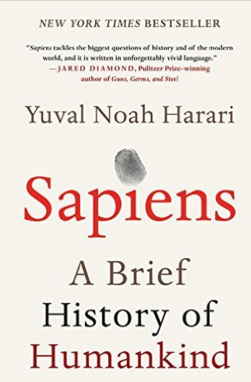 Harari talks about the beginnings of humans and how we as a species started out as apes in the plains of Africa and true, we made tools, but it wasn’t for hunting so much as for breaking open bones of other animals after the primary predators had eaten them. We were looking for bone marrow. For much of our species’ history, humans were scavengers. Each chapter looks over another point in our species history, especially as we moved from hunting-and-gathering, to the agricultural revolution, to the industrial revolution, to the information age. There are some things of the book that stick in my mind to this day. Human beings’ behavior is determined by their genes, the same as every other animal. And just like every other animal, we don’t extend group-level benefits to people outside of our group. We are naturally xenophobic. Yet for some reason, humans are able to co-operate between each other as large groups of strangers. That is unusual and is unique to our species. 1. Money – we may not trust each other, but we trust what money represents. And because we are able to trust what money represents – that we can buy things and that it is backed by the government or the trust of everyone else that we can exchange money for other things – strangers can come together and exchange goods without fear of harming each other. Money is a made up thing; there’s nothing that says we have to believe in it. Yet believe in it we do. 2. Empire – large groups of strangers come together to form empires and pacify nations, and also grant a series of basic rights to the individual. Empires are largely imaginary, they exist because we all agree that they exist. But because we agree that they exist, it allows us to cooperate with each other and divide ourselves into in-groups and out-groups. 3. Religion – religion gets a bad wrap from all the skeptics and atheists out there but nobody can deny that religion is amazing for bonding strangers together into a common cause. And religion is not just about supernatural beliefs, there are secular ones too (e.g., communism), complete with its prophets and list of sins. Harari also goes into the pervasive meta-religion of our time – Romantic Consumerism (of which my friend Frank is a dedicated member). Romantic means “many different experiences” and consumerism means “to buy or acquire things.” So, our society worships at the church of buying many different things. Modern day ascetics (and you know who you are) decry this, but it’s an important religion. For most of our species history, we spent the majority of our time in subsistence living, barely producing enough for ourselves and an elite who ruled over us who had time to specialize in other things. Yet as technology improved, it made it possible for many people to produce much more than they could consume, giving many people time to specialize and earn money. Yet if you are producing more than you can consume, then you need people to do the consumption of those goods and services. Without them, you have a lot of people with nothing to do, and that leads to social instability. So, romantic consumerism is a double-edged sword with positives as well as negatives. At the end of the book, Harari talks about basic human happiness. We have all this stuff, but are we any happier? For sure, our lives are way better – people have more money, we live longer, and have fewer diseases to degrade the quality of our lives. Yet our lives are also much more complicated compared to medieval peasants who, despite having tough times, did have a strong sense of family, community, and a promise of a pleasant afterlife. And people today struggle mightily with depression and mental health medication. And even if humans are happier, at what cost are we happier? We can eat meat, yet the animals we consume for meat live miserable lives. Cows, pigs, and chickens do not lead good lives. They are often stuck in their cages and pens, force fed and always pregnant or nursing, only at the end to be slaughtered for human consumption. Even though some animals lead better lives like racehorses, cats, and dogs, most other animals lives are worse. We humans justify it by saying we are a class of species by ourselves. Yet doesn’t that sound like a hollow rationalization? People have been using that excuse for centuries as ways of oppressing their fellow humans. It makes me stop and pause every time I eat meat. I want to read this book again, I liked it that much. It has forced me to rethink how I think things, and while there are many books that I enjoy and enlighten me, I loved this one. Yesterday, for the first time ever, I got the flu shot. I have never done this before because I didn’t think I needed it. But last December, I did get the flu and it was the worst sickness I ever had, at least in the past 10 years. I made a resolution right then that the next year I was getting the flu shot. Well, this year came around and I remembered my promise and I just about chickened out, but in the end I decided to get it. I went in for my appointment and talked to the health professional who asked if I ever had gotten a flu shot before and I said “I don’t think so.” I definitely haven’t had it in the past 20 years, but maybe I had it when I was younger. Anyhow, she explained what would happen and the possible side effects. The shot itself wasn’t too bad, it stung a little bit but I’ve had worse scratches by the cat. On the other hand, the possible side effects turned out to be real side effects. My arm did get more sore as time went on for the rest of the day. I also became tired in the evening, and today I have some aches in my lower back. These are all symptoms that I had with the flu last year, although they are much milder. Still, if I don’t get the flu, it’ll be worth it. But another reason to get the flu shot is that even though the odds of it working are not guaranteed, if it does work, it cuts down the risk of me infecting someone else with a weakened immune system such as a child, an elderly person, or someone who is sick. And, I think that all of the anti-vaccine people are a bunch of quacks, so I figured I’d do my civic duty and get the shot in order to add to the herd immunity.